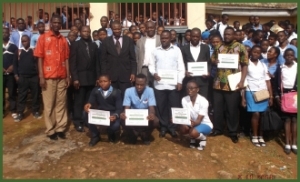 The launching program of the DI Project for the North West Region took place from 3rd – 5th November 2014 at the premises of Progressive Comprehensive High SchoolBamenda (One of the largest schools of the North West Region). 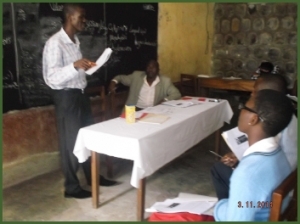 The program began with a Coordination meeting with representatives of selected schools on Monday November 3rd. This meeting was to acquaint school officials about the project and discuss its implementation among the selected schools. 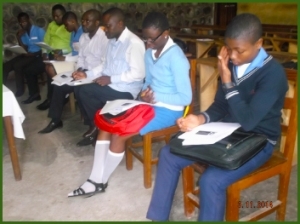 In attendance were teachers and students of the four selected schools of the project in the North West Region (Government Bilingual High School (GBHS) Bamenda, Progressive Comprehensive High School (PCHS) Bamenda,The Apostolic Secondary School (TASS) Bamenda and Government High School Mambu-Bafut) and the Regional Coordinator of the DI Project for the North West Region Mr. Hilary Wamey.